Viks Casino Review -- Get Three 100% Deposit Matches Bonuses! 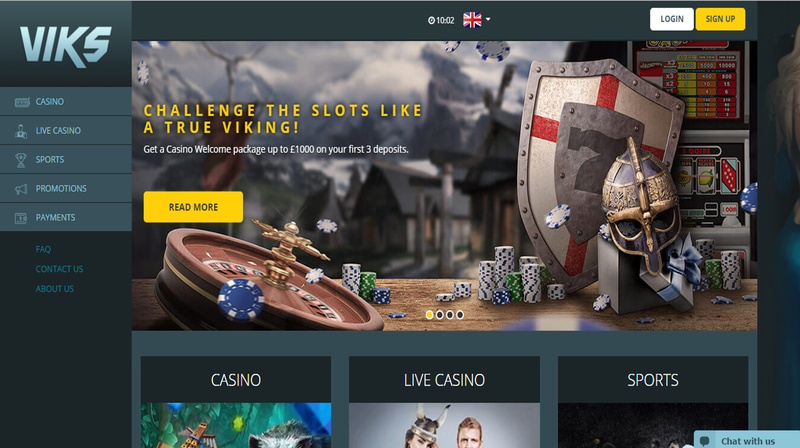 Viks Casino Review — Get Three 100% Deposit Matches Bonuses! 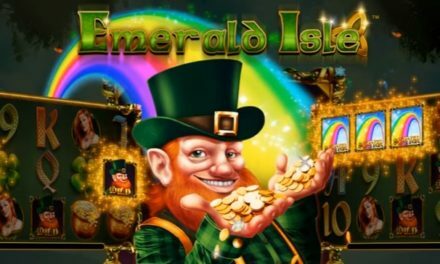 Viks casino offers generous bonuses plus a whole ton of slots and live table games! Ever wanted to played a casino named after a famous brand of vapor-rub cream? Well Viks casino is the ideal place for you. Aside from sharing a very similar name, it has nothing to do with the pungent body cream that helps cure cold and flu. Viks is a very sophisticated and highly equipped mobile casino that specializes in mobile slots, live casinos and sports betting. Here you will find games from all the top developers and a massive 3-part welcome bonus. But what else does it have to offer? Find out more by reading our full review. Viks is for anyone who's into casinos with a very polished look. Everything is divided into the right category, from mobile slots to live casino games, making the site easy to navigate. We here at Mobile Slots 4U think navigation at a mobile casino is extremely important; it plays into the user-friendliness of the website and is one of the contributing factors in whether players choose to sign up or not, even if the choice is an unconscious one. So it has points for that but it also wins more points for having such a great selection of games available. From classic video slots to live sports betting, it covers quite a bit of ground in the variety department. But the quality is where it matters and we do think that Viks is a quality casino. The games available at Viks are where the casino shines. Not only do you get quality content from top developers like NetEnt (Starburst and Gonzo's Quest just to name a few) but you also get them put side-by-side with live roulette and blackjack. Of course, there are not just video slots to choose from either. You get a vast array of classic slots, jackpot slots, table games and various lotteries. So you're never short on choice at Viks. You can choose a form of gambling you prefer and stick to it. So if sports are your thing more than casino games, you can explore their sports betting page and choose which sport you'd like to bet on. This can be football, tennis or basketball. The best thing about it, though, is that all their games can be played from a wide array of devices, from mobile to desktop. This is a very useful for players that like to gamble on the go but also serves as a great place to start if you're new to mobile gambling. Simplicity here is key. 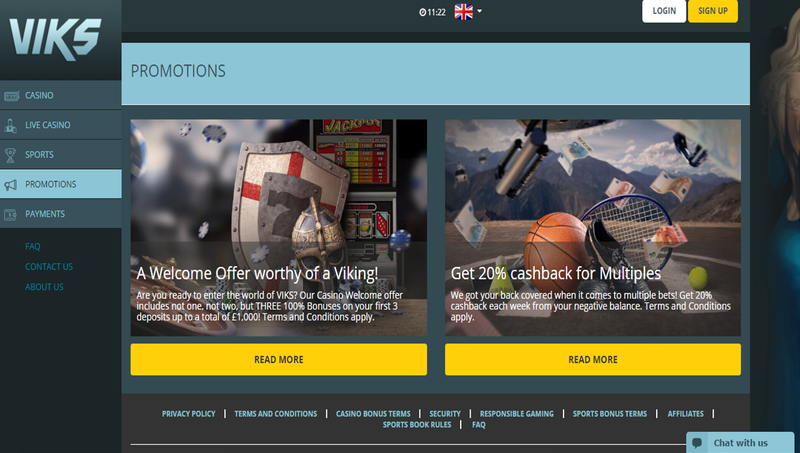 Viks casino has an enticing amount of promotion schemes on offer. Next to all their games, the two compliment each other nicely and help players sufficiently in getting up and ready for their gambling experience. The welcome bonus alone is worth talking about. Very rarely do you see a casino that offers a 100% deposit welcome bonus three times in a row. Of course, you do see mobile casinos that offer a welcome bonus three or even four times after you sign up. However, they don't always offer a 100% bonus for each deposit. Usually, the number goes down and down until it reaches 25% or 50%. Here, on the other hand, you'll get a 100% deposit match of up to £1,000 guaranteed for your first three deposits which is both unique and very enticing. Not only that, but your deposit match gets higher every time you make one. For the first, it's £200, the second £300, then finally £500 for the third! It's an incredible way of getting your due before you've even made a single wager. The only downside is that the minimal deposit gets higher too. At first glance, you may think that Viks only seems to provide two promotions. The welcome bonus and the cashback bonus. While this is a little worrying, it is a relatively new casino so we'll give it time before it delivers more. In the meantime, however, the promotions they do have are pretty great. We've already spoken extensively about the welcome bonus but the cashback bonus is also pretty good. Place multiple best (at least £2 on 2 lines) on a slot and you'll get a 20% cashback of up to £200. This is a pretty ongoing promotion so it feels like there's more to offer. Payment at Viks, like at many mobile casinos, is very simple. Simply click on their ‘payment page' to see what options they have available. But to summarize, you can pay using: VISA and Mastercard, EcoPayz, Neteller, Skrill, Paysafecard, Webmoney, and bank transfer. Minimum deposits range between £10 and £20. Withdrawals are around the same and, judging by the average, it takes between 3 and 5 days to get your money. But it rarely takes as long as that! There is a Live Chat function at Viks casino which you can use if you want to find an answer to your problem. There's also a phone pine you can dial at +44 20 3389 6555. You can submit a problem via a contact form, however, if you're problem cannot be immediately resolved. Want to play at Viks? Viks is, modern with great games and promotions! Viks Casino Viks is a casino that shows a lot of potential when it comes to games. Its promotions may not be numerous but what they offer does hook you and make you want more. And who knows? Maybe in the future, they'll release more in the future. For now, however, you can be sure to enjoy Viks with their wide array of slots, live casino games and sports betting. It also wins points for having a great website design. On the whole, it's a good casino for beginners and for exclusively mobile users. NextHas Online Gambling Become Too Homogenized?